Imagine this. A warm summer breeze wafts by, you hear the rustle of the leaves in the distance, with nothing to worry about, you enjoy a glass of cold lemonade and get lost in your thoughts. Your eyelids get heavier as you slowly rock side to side in your hammock. Just as you drift off, you hear a snap and you end up on the ground, bottom a little more bruised than before. Don’t let that happen to you! Always make sure your hammock is set up correctly before relaxing. Buying a hammock from a reputed manufacturer does not mean that each and every part will be working fine. For your safety, check the hammocks carefully before using it. If you feel that there is any need of replacement, contact the manufacturer immediately. Learn how to pick out your perfect hammock. Not all trees are equal when it comes to hanging your hammock. While you want to make sure the two trees are a good distance apart, some trees are better than others. The biggest danger to avoid is hanging your hammock on dead trees. While they may seem sturdy at first, it’s almost impossible to tell if your weight pulling on it will cause it to snap. If you’re lucky, you’ll end up on the ground with a scare, but serious or even fatal injury can occur if the falling log happens to land right on top of you. Even living trees can still pose a danger. Just like setting up a tent, make sure you look up and avoid trees with large, dead branches. You never know when a strong gust of wind may snap it off the trunk and send it falling right at you. Additionally, you should avoid saplings and only go for trees that will not bend under your weight. 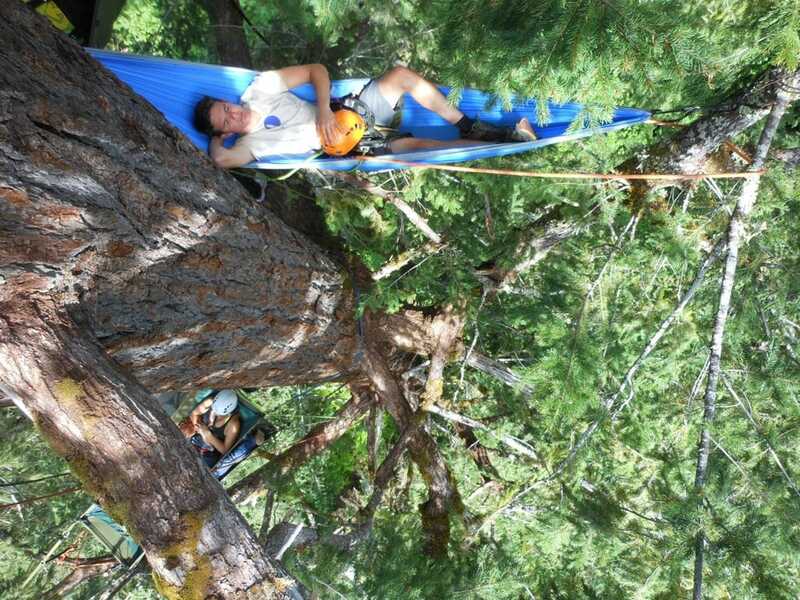 Not only will your hammock sag onto the ground, but it damages these young trees and can stunt their growth. Hammocks are available in different sizes and styles. 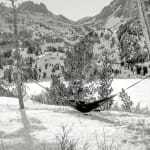 For adventures in the great outdoors, many prefer portable camping hammocks, as they generally do not have stands and setup only requires you to look for two sturdy trees or other pole-like anchor points. Even though it might look pretty cool, don’t place the hammock at such a height that it becomes difficult to climb into. Here’s how we set up a Serac Hammock. Be sure that the straps are properly fixed to the tree, and that the carabiner is securely clipped in so it doesn’t detach when you doze off! For those of you that are just looking to hang out in your backyard, a sturdy hammock stand may do a good job. Just make sure that everything is assembled correctly and the stand is on a flat, even surface. The last thing you want is for the stand to collapse, bringing you down to the ground along with metal pipes flying at you! The obvious question that is associated with a hammock is, are you comfortable in the hammock? We need to ease the body slowly inside the hammock. A shift in weight may lead to tilts and you may uncomfortably end up in the ground. Hammocks have weight limits, so if your kid is eager to join you in the hammock, take precautions. Always be sure to check the weight limit’s of your hammock before adding two people. Don’t be afraid to hop out of the hammock and readjust the suspension if you feel like you can get more comfy! If you find a creek or lake that you want to relax next to, think carefully before putting the hammock too close to the water. It may tip or tilt you overboard if improperly setup. If you do want to relax above a small stream, choose a shallow spot and think carefully about how you will get into and out of the hammock. Small rocks and logs become very slippery in the water and it’s easy to lose balance trying to use the hammock if you have to wade into the water to do so. Enjoy the natural beauty, but be smart about it! You should not jump or bounce around inside the camping hammock. Hammocks usually have high carrying capacities, but over the years, natural wear and tear may occur. If you are going for a camping trip, always check the accessories for damage first. 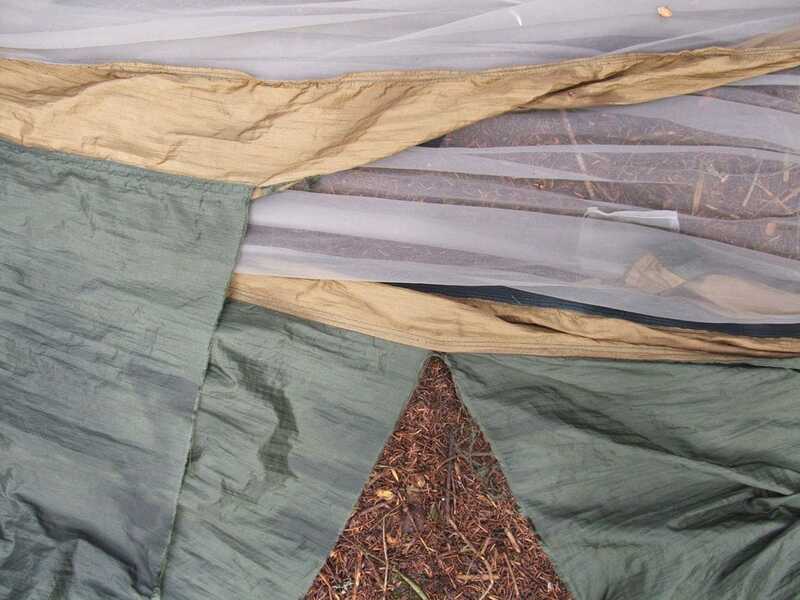 If your hammock rips or the straps break the first day of your trip, it will very difficult to salvage the rest of your trip especially if you do not have another form of shelter with you. If you are still unsure about the carrying capacity of the hammock, always check with the manufacturer first. If you’re using your hammock at home with a frame, make sure it is installed it somewhere stable. Always sit on the hammock and slowly shift the weight of your body. You should never try and get into the hammock feet first. There’s a good chance the hammock will flip and send you careening into the ground. Similarly, please don’t try to stand in your hammock – that’s just asking for trouble. Enjoy the time in hammock, but do not go overboard with enthusiasm! Take precautions for an uninterrupted blissful time! 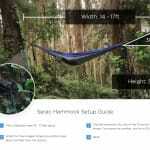 This entry was posted in Informational, Safety, Setup and tagged Backpacking, Camping, Hammocks, safety.